The north shore of Superior has always been a hazardous area to mariners. Sluggish compass reaction combined with huge deposits of iron in the rocks along the shore play havoc with navigation. Nowhere is this variation greater than along the shoreline between Two Harbors and Beaver Bay where mariners are warned in the Great Lakes Coast Pilot to expect total compass deviations of 2.2 degrees, with many a mariner ending up on the rocks while making his way along the north shore at night. Combine this magnetic aberration with a major storm, and you have a natural recipe for disaster. Such was the case in 1905, when a series of back to back storms between November 27th and 29th whipped the big lake into a froth, causing the loss or damage of 29 vessels and over 200 associated deaths. A survey party was dispatched to the area, and selected a 7.63 acre-parcel of land between Two Harbors and Beaver Bay at the upper edge of a 127-foot tall cliff known locally as Stony Point. While the site selected for the station was atop Stony Point, for some reason the Lighthouse Board named the station after Split Rock River, three miles to the southwest. Negotiations for purchase of the site began immediately, however after a year of negotiations, no arrangements were forthcoming. Evidently the owner had a change of heart after District Engineer Major Charles Keller instituted condemnation proceedings on the property, and with clear title in hand late in 1908, Lighthouse Engineer Ralph Russell Tinkham drew up plans and specifications for the new station. Material contracts were awarded to a number of suppliers, and the contract for supplying the 30 to 50 men required to do the actual construction awarded to L. D. Campbell & Son of Duluth. With the planning phase complete, work began at the site in June 1909. With no roads servicing the area the construction crew was forced to transport all materials to the site by water. Fortunately, the water depth at the bottom of the cliff was sufficient to allow vessels to pull close to the cliff face, and a timber derrick was erected atop the cliff. 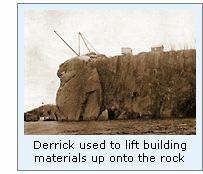 Outfitted with a hoisting engine, the derrick was swung out over the cliff face, and all materials required for construction were hauled to the top. After establishing a working camp atop the cliff, the crew began blasting foundations for the station buildings. Plans called for the lighthouse and fog signal building to be erected on a single large concrete foundation, and the three dwellings to be located in a row to the north. By July, all of the required construction materials had been received, and either transported to the site, or in storage at the Detroit lighthouse depot in readiness for shipment. 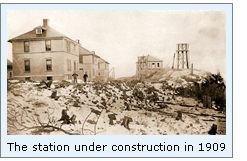 With winter’s icy grip falling over the north Superior coast, work at the site ended on November 21, 1909, and the work crews left for home. The contractors returned to Spilt Rock on May 1, 1910, and were elated to find that their work of the previous year had withstood the rigors of the Lake Superior winter. The new Second Order Fresnel lens was received at the Detroit lighthouse depot on May 20, and soon thereafter the lens and the mechanical equipment for the fog signal building were loaded on the lighthouse tender AMARANTH, and delivered at the station. The construction crews evidently worked at a feverish pace over the spring and summer, since by the end of June the fog signal building was complete, the steel support framework for the tower had been erected, and work was almost complete on the erection of the three keepers dwellings. Work was finally brought to completion, and the new light exhibited for the first time on the night of August 1, 1910. On completion, the lighthouse itself consisted of a pyramidal octagonal Cream City brick tower with concrete trim atop a concrete foundation which extended 2 feet six inches into the rock. The tower was surmounted by a brick watch room and a cast iron lantern with vertical astragals. Within the tower, a cylindrical glazed white brick lining housed a set of spiral cast iron steps which provided access to the watch room and thence to the lantern above. A structural steel framework sandwiched between the inner and outer walls provided the structure with the immense strength needed to withstand the heavy wind loads predicted on the stations lofty perch. A combination cleaning room and office was attached to north side of the tower by a short passageway. Seated majestically in the lantern, the Parisian-manufactured Second Order Fresnel lens was of "bi-valve" design, so called due to its resemblance to a mollusk shell. Consisting of two large panels made up of 7 refracting prisms and 13 reflecting prisms each, the entire assembly floated on a bed of liquid mercury to minimize rotational friction. A clockwork mechanism once every 20 seconds, providing the station’s planned characteristic of a single white flash every 10 seconds. The lens was illuminated by a 55-millimeter double tank incandescent oil vapor lamp, providing a remarkably bright light of 1,200,000 candlepower. By virtue of the tower’s location atop the cliff, the lens boasted an impressive 168-foot focal plane, and was visible for a distance of 22 miles in clear weather condition. Approximately forty feet to the east of the tower, the fog signal was constructed of the same Cream City brick as the tower. 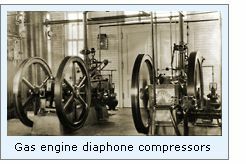 Located on a single bed within the building, a pair of 22-horsepower gasoline engines drove two large compressors which supplied compressed air to the duplicate Type 2-T diaphone fog signals with their large trumpet-shaped resonators protruding from the lakeward side of the building in order to project their sound five miles across the lake. The "2-T" designation for the diaphones indicated that they were of "two-tone" design, providing the quintessential melancholy "Bee-Oh" sound every 20 seconds. The fog signal was so loud that it reportedly made horses skittish five miles away in Beaver Bay, and caused guests at Slater's Hotel to ask what wild animal were making such a racket. The three identical brick keepers dwellings sat in a row to the north of the lighthouse. Each on its own cellar containing a water cistern and cold storage, their first floors provided a hall, living room, dining room and kitchen, and their second floors three bedrooms and a bath. A main concrete walkway lead from the lighthouse in front of the dwellings, each with its own walkway branching off the main walk at a crisp 90° angle. Each dwelling was provided with its own barn across the main walkway for the keeper’s horses and feed. A log crib pier was erected on a rocky beach area approximately 1,000 feet to the west of the station, with access gained by a long timber stairway which hugged the rock face at an area where the slope was a little less severe. A wood framed boat house situated beside the pier provided storage for the keeper’s boats, which the used for transporting small supplies to the station, and for fishing trips along the fertile lakeshore. Under a special separate appropriation, a concrete oil storage building was erected at the station late in 1910, to allow the storage of kerosene a safe distance from the main station buildings. All told, the station was completed for a total cost of $72,541.00, which was $2,459.00 below the appropriation made three years earlier, and amazing feat when one considers the logistical problems associated with construction at such a difficult and remote location. A seasoned Head Keeper was needed to take charge of the new station, and Orrin "Pete" Young fit the bill perfectly. Fifty-two years of age, Young had entered lighthouse service as Second Assistant at Huron Island in 1901. Promoted to First Assistant in early 1903, he accepted a transfer to Grand Island East in 1908, in which capacity he had been serving for the past two years. The offer of a promotion as Head Keeper of a new first-class coast light station would have been an enviable offer, and it is no surprise that Young accepted the promotion, arriving at the new station to take command on July 20, 1910. First Assistant Keeper Edward F. Sexton had hired in at Devils Island as Second Assistant in April 1910, and arrived at Split Rock on August 31. With the arrival of Second Assistant Roy C. Gill, the station roster was complete. Gill had served as Second Assistant at Huron Island, and he and Young likely had the opportunity to swap a few stories about their time the island. In the early days, the station was considered so remote that it may as well have been located on an island. While the area around the lighthouse had been clear-cut to ensure a full arc of visibility of the light, thick virgin forest spread beyond the lighthouse grounds in all directions. With Lake Superior as the only way on or off the rock, the station’s mail was delivered to a lumber camp at the mouth of the Split Rock River, which was considered by Duluthians to be the eastern extent of civilization on the north shore. On Sunday October 2, 1910, Assistants Sexton and Gill left the station at 12.30 p.m. in the station’s small rowboat on such a mail run. While Keeper Young was understandably concerned when his Assistants had not returned by nightfall, he was unable to leave the light unattended until the following morning, when he set out at 8.00 a.m. on another boat to search for them. He quickly discovered the empty boat floating bottom-up two miles to the east of the station. Faced with the realization that that both of his Assistants had likely drowned, Young searched the area for their bodies to no avail. Needing to return to the station before dusk to exhibit the light, Young was forced to abandon the search, and towed the Assistant’s boat back to the station. On returning to the station, Young found the boat’s boom had been lashed to the seat. A consummate sailor, Young knew better than to lash the boom, since without a keel the rowboat could easily be blown over in a stiff wind were the boom not allowed to swing free. While Young reported in the station log book that he searched for the bodies every day for the following two weeks, they were never found. Young sent word to the Detroit office of the death of both of his Assistants, requesting the appointment of replacements as soon as possible. Sadly the late First Assistant Sexton’s pregnant wife and young child left the station on October 6 on a motor launch dispatched to pick them up from Two Harbors. Lee Benton was selected as Young’s new First Assistant. A thirty-two year old with five years experience as Assistant at Devils Island, Benton reported for duty at Split Rock on October 15. Second Assistant James W. Taylor, a freshman with only two years of lighthouse service under his belt at Point Iroquois and Duluth arrived from Duluth three days behind Benton on the October 18. After a few years, the derrick used for lifting supplies to the station proved to be hazardous and cantankerous, and the lighthouse tender AMARANTH arrived at the station in the fall of 1915 to deliver a Lighthouse Service engineer and German carpenter and materials to erect an elevated tramway alongside the stairway leading down to the pier. The tramway was completely constructed of steel reinforced concrete, poured into wooden forms erected on site. Supported by concrete trestles, a pair of iron tracks lead from the water edge to a the top of the bluff. A small car with flanged wheels and a horizontal upper surface was pulled up and down the rails by way of a gasoline engine located within a small hoist house at the top of the bluff. An iron turntable on flat ground in front of the hoist house allowed the car to be disconnected from the cable, rotated and switched onto a second set of rails which lead to the dwellings and oil storage building. The work was completed in 1916, and the old derrick removed from the cliff top. With the construction of North Shore Highway past the station in 1924, the station’s isolation vanished immediately, as growing numbers of tourists took the drive from Duluth to visit the station. Light keepers were mandated to "be courteous and polite to all visitors and show them everything of interest about the station at such times as will not interfere with light-house duties." However, it is likely that in this respect the Split Rock Keepers were challenged highly. In 1936 alone, 30,000 visitors signed the station’s visitor log, and it is hard to imagine how they were able to keep up with such an influx of visitors. 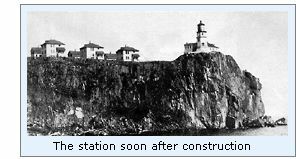 With the installation of commercial electric power along the North Shore Highway in 1941, the station was electrified in 1941. With electrification, the incandescent oil vapor lamp illuminating the Fresnel lens was removed, and replaced by an incandescent electric bulb, with a decrease in intensity of the light to 450,000 candlepower. Advances in RADAR and LORAN-C rendered the lighthouse obsolete, and thus the station was closed and the light permanently extinguished in 1969. The Minnesota Historical Society obtained ownership of the property in 1971, and operates the station as a living museum, with the structures restored to their pre 1924 appearance. Lee Radzak today serves as full-time keeper, who along with a number of live-in docents give tours of the station and presentations on the history of the station throughout the Great Lakes. Each year the Lighthouse marks the anniversary of the loss of the Edmund Fitzgerald with a public program that includes a reading of the names of the 29 men who lost their lives on the Fitzgerald on November 10th, 1975. The lighthouse, normally closed during the winter, is reopened for this one day event and the beacon is lighted at dusk. Hundreds of visitors have attended this event each year since the ceremony was started in 1985 on the tenth anniversary of the sinking of "the Big Fitz." This program provides a once a year opportunity for visitors to be inside the lighthouse after dark with the beacon again sending its warning across the dark depths of Lake Superior. Click here to see a complete listing of all Split Rock Light keepers compiled by Phyllis L. Tag of Great Lakes Lighthouse Research. We had been longing to get to see Split Rock since we saw our first picture a number of years ago, and thus it became the main destination of our 1999 lighthouse hunting expedition. It turned-out to be everything we had hoped it would be. We almost missed our first glimpse of the lighthouse through the trees, about a mile east of the rock. We made a quick turn around, and pulled off the road to eat the lunch we bought in Two Harbors with the view as seen in the photograph to the left. Driving on, we entered Split Rock Park, and wandered the grounds. The entire interior of the tower and the attached building is finished in a shiny white ceramic-coated brick and natural oak woodwork. The entire complex has been meticulously restored, and costumed docents make themselves available to answer questions. One can get down to the water by way of 174 steps, which are located alongside the old tramway, which was used for pulling supplies to the light station from a dock on the shore. The view from the Lake is breathtaking. The trees on the grounds were laden with berries. and the air was thick with cedar waxwings which were making a feast of the bright red fruit. Take Hwy 61 Northeast along the shore of Lake Superior through Two Harbors and on to Split Rock Lighthouse State Park. Keep an eye out for the view of the lighthouse approximately 1/2 mile West of the park entrance. The park entrance is on the right, and all roads in the park are paved. There is plenty of parking, but the lot gets filled quickly around Holiday weekends. Entrance to the lighthouse and grounds is gained through the Visitors Center at the rear of the parking area.